Today is an exciting day for Nyeri as we warmly welcome yet another global brand to join the Nyeri business community. We have all grown with the Toyota Brand on our roads. Toyota is an international brand that has become very local and we have embraced it as a part of our Kenyan lifestyle, indeed the car in front is always a Toyota. The kaizen ethos that has propelled Toyota to excellence of ‘always improving’ resonates with our New Way of doing things in Nyeri County where hard work has defined my government. We must make hard work and excellence to become fashionable and an esteemed way of life and develop it as our culture during my years as the governor of Nyeri. We boast of a very hardworking and informed populace that is ideal for any business to thrive. We have endeavored to create a very conducive business environment to make Nyeri an attractive investment destination. The opening of Toyota Center in Nyeri is a testament that our efforts are paying off. We have recently welcomed Davis & Shirtliff International, Komposite Kenya Limited from America, DTB Bank among others and we are proud to be a county of choice for investors. We have cumulatively attracted in excess of 1 Billion worth of new investment with the potential of creating more than 500 jobs. We have developed an open door policy to make it easier for investors to navigate the county bureaucracy and cut the red tape. We have developed a raft of policies like investment policy and the Finance Act to make Nyeri a stable and predictable investment destination. Nyeri faces an urgent demographic challenge where we are churning out so many well educated youths into the market. However, we chose to see this as an opportunity for our investors. We are therefore committed to continue investing heavily in the development of employable skills as we seek employment opportunities through new investments in our county. We have great institutions like Kimathi University and Karatina University that provides a perfect opportunity for industry and academic to converge and add real value to the community. Our young people are not only future employees and customers. They are dreamers, doers and thinkers – they are the new leaders. They live in a world of endless possibilities to create more sustainable economies. We therefore seek your partnership and ideas to face this most noble but daunting task of our time. Our county is strategically positioned to serve a very wide catchment area of customers due to its strategic geolocation. We are within the Lappset Corridor. The corridor progresses in a tripartite – LPG, Road and railway. Development happens approximately 40 KM on both sides of the 40KM of every corridor and we are well covered. The Lappset corridor gives us adequate infrastructure and connectivity. We take this opportunity to invite Toyota Kenya Foundation to partner with the County Government of Nyeri in its mission of giving quality service to the people. We note that your foundation seeks to provide opportunities for Kenyan children from disadvantaged families to pursue either Basic and/or High School or College education in the fields of medicine, engineering, environmental management & agriculture. These are great areas of cooperation that complements our investments in the community. My government has just invested 100M in provision of over 13,827 bursaries to needy and endowed children all over the county including needy cases from day schools. We hope you can look into the possibility of partnering with us in this noble endeavour. My government is very passionate about the youth. I am aware that Toyota Kenya runs the Toyota Academy where you have training programmes targeting the youth. 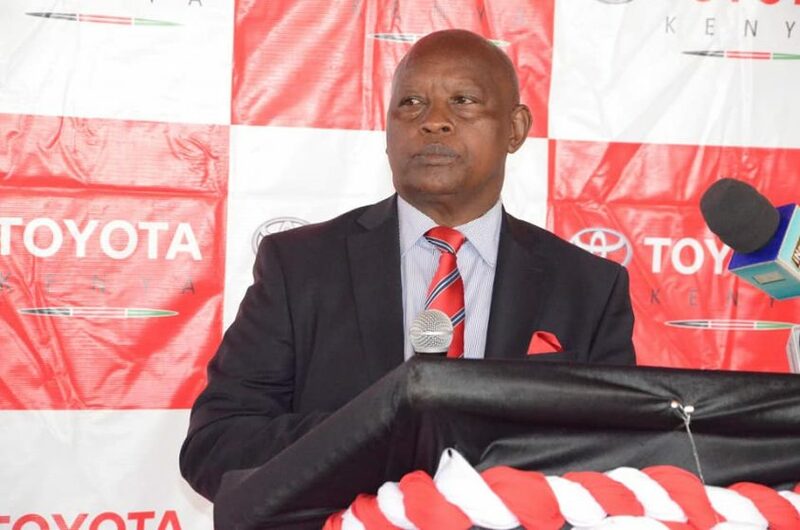 We humbly request that your entry in Nyeri be accompanied by the provision of vacancies for the youth of Nyeri to benefit from Toyota’s best practice and superior training to equip them and prepare them for the job market. We invite you to partake of our endowed county and may you prosper within our borders.